Star garnet exhibits the optical phenomenon called asterism, a star-like pattern created on the surface of a gemstone when light encounters parallel fibrous, or needle-like, inclusions within its crystal structure. Light that strikes the inclusions within the gem reflects off of the inclusions, creating a narrow band of light. When two or more intersecting bands appear, a star pattern is formed. Depending on the crystal, the star may have four, six, or even twelve rays. When only one band forms, it is classified as a "cat's eye". refractive index, SR nature and spectrum. Color is also helpful. Stones with SG lower than 3.8 and a RI lower than 1.76 are pyrope and those with higher SG are almandine. 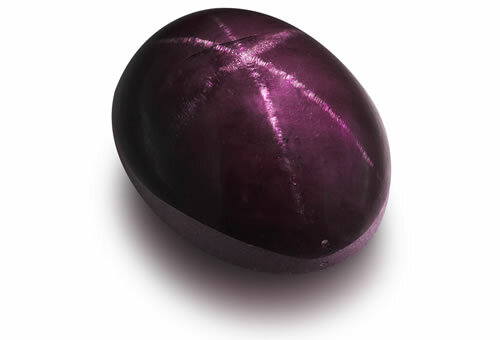 Stone are only star rhodolite if there is a purple component to the color. Pyrope-almandite garnet is a type II clarity stone. Needle like inclusions produce 4 to 6 rayed stars and will sometimes show both in well cut stones. Stones might have zircon crystals with stain halos and irregular rounded included crystals that might be zircon or apatite.